Crisp white brick Colonial nestled among the greens of giant hollies, privet hedges, evergreens and colorful azaleas! On a deep, fenced and highly landscaped lot, the house sits next to a block of contrasting brick Tudors. A portico covers the flagstone entry and introduces the interior. Its center hall creates a familiar pattern of flow for the first level. Its curb appeal belies the homes depth, the size of the enclosed rear garden and a 3-car garage. With four finished levels, this solidly-built home has such special features as a recently designed kitchen, an enclosed sun porch, a large master suite with adjacent paneled den/library with a wood- burning fireplace and secret closet. The light and open top floor area has an accompanying bath, while an extensive lower level includes a built-in bar and sauna. 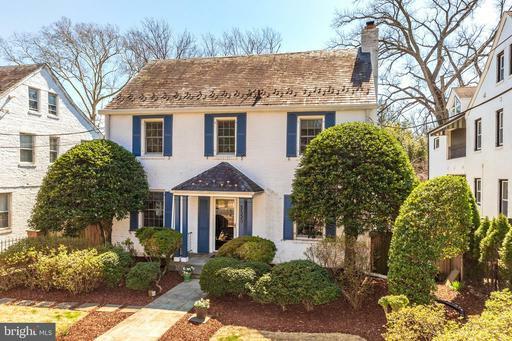 With an over-the-top walkability index, this lovely home is located between two Red Line Metro stops and lies between Connecticut Avenue to the East and Wisconsin Avenue to the West. 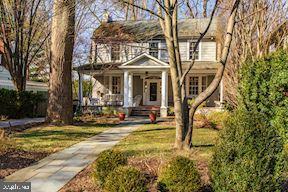 Proximity to Reno Road provides for easy access to both downtown DC and the northwestern suburbs.